Can you identify the equipment in this photograph? Black and white negative of farm machinery on display at an Agricultural Trade Show. 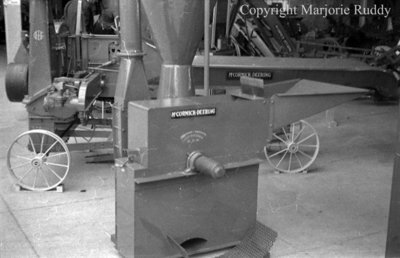 The sign on the side of the machine states "McCormick-Deering". Visible in the background are other McCormick-Deering farm machinery. This negative was part of a negative strip that was found rolled up in a wooden box without any identification of the event or people in the photographs. Written on the wooden box: Marjorie Ruddy negs 45 each. Agricultural Trade Show, c.1947, Marjorie Ruddy. Whitby Archives A2013_040_841B.